The six-yard khada dupatta required a whole nine yards of the heaviest gold borders to include both elaborate edges or pallows, with a particular order of gota masala stitched just so. The gala, the baghli, the aasteen, borders around neck, armholes and arms had to match the one attached to the chowhashia dupatta, a heavy fabric of gold checks, specially woven in Paithan and Banaras. On her wedding day, for the first time, a girl wore a kurti choli with the khada dupatta. 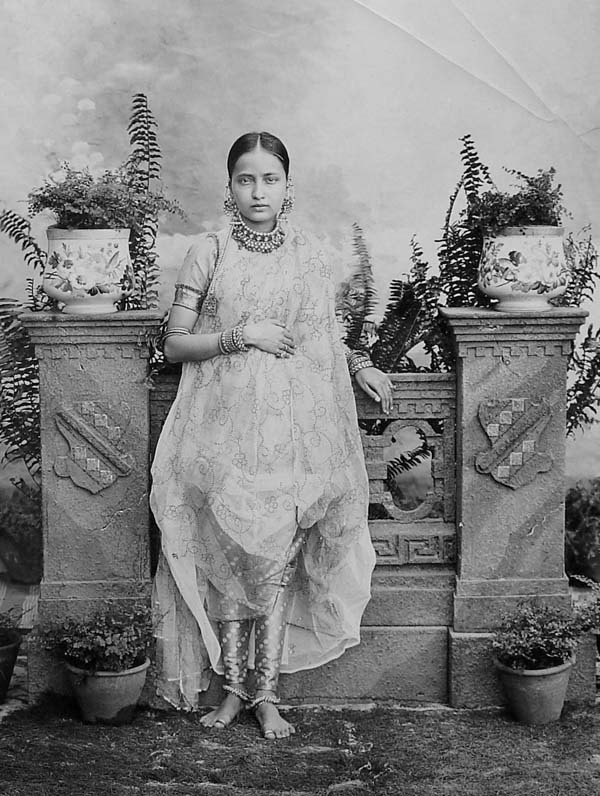 The choli, her only undergarment, all handstitched and knotted in front with gorgeously bordered sleeves, over which came the sleeveless kurti with a heavily worked round neckline, provocatively slit in front. The Banaras brocade pyjama was colour coordinated with the kurti choli. The Untold Charminar, Syeda Imam. 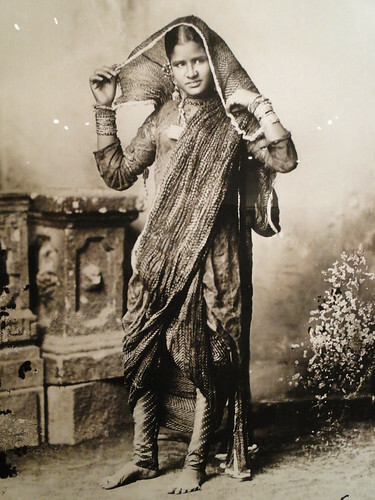 There seem to be more than a few fusion sari/dhoti sari (X, X, X) ensembles of late – though a lot of them look less sari and more modern take on the Deccani or Hyderabadi khada dupatta. The khada dupatta is as long as a sari but requires a base of a long sleeved tunic or kurti and the pyjama. The way the dupatta is draped seems to vary though a few versions look like the sari drape on the upper part. Lighter, gauzy versions of the dupatta like in pic 3 were also prevalent. A youtube tutorial on how to drape a khada dupatta, note that the drape differs a bit from today’s pictures. Pics: Hyderabad girl, Raja Deen Dayal, Chunnu Begum in 1915, Mahal-e-Mubarak in 1915, Soha Ali Khan (link has info on the khada dupatta) and Sonakshi Sinha. This is possibly the version for a young girl which had a shorter dupatta and was worn with a cap. This entry was posted in 1910s, dupatta, Indian fashion, regional styles, Salwar Kameez, vintage fashion, vintage style and tagged 1910s, deccan style, dupatta, fusion sari, hyderabad, khada dupatta, khada salwar, nizam. Bookmark the permalink. Could you do a post on the evolution of the Rajputi poshak? I did see the makeupandbeauty site when doing this piece. The youtube drape is different that is why I linked it – though I am fairly certain I have seen it in vintage pictures of mahbubia girls. But conceptually its quite the same I think. Though three piece ensembles are found in many parts of India, either with a skirt or pyjama below, the Hyderabadi outfit is a little different imo because it uses a kurti-pyjama as a base and the drape is a little akin to tying a kacham e.g. the back tuck. I will certainly have a look at Rajputi poshak – it might take some time because I try to have a few images before putting up a post.